Please read this Notice with care as by using this site you agree to be bound by its terms. If you have any queries please contact us. Protecting your privacy is important to us. We promise to respect and safeguard your personal information. We shall try to ensure that your details are accurate and kept up to date. We set out below how we use this information. We collect personal information either directly from the relevant individuals or indirectly from third parties. For example, an insured may not only provide us with information on themselves for the purpose of obtaining our services but also on other insured's who they represent. We may also obtain personal information from past insurers, witnesses to claims, health care workers and publicly available sources etc. We will respond to your query or complaint as soon as possible and will try to resolve any complaint within  working days. If this is not possible, we will contact you within that time to let you know how long we estimate that it will take to resolve your complaint. Any unresolved complaints should be referred to the Privacy Commissioner. Please read this Notice with care as by using this site you agree to be bound by its terms. If we decide to make changes to the Notice we will post any changes on this page. If you have any queries please contact us. We collect and use personal information to allow us to give you a quote or process your purchase of a policy. Such information may include your name, address, telephone number, e-mail address, bank details and renewal date(s) as well as your credit or debit card number and expiry date. 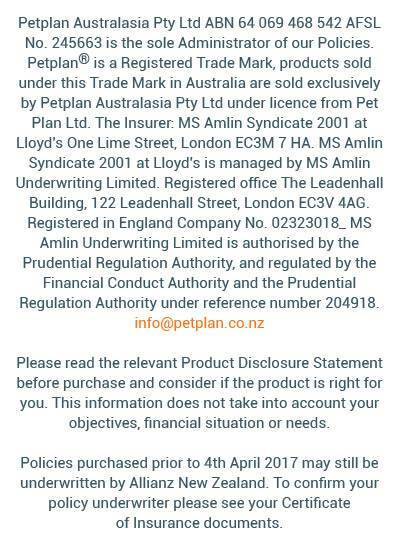 The information you supply may be used by the Petplan Australasia Pty Ltd/Ford Kinter Group and their agents for insurance product administration, customer research and to keep you informed by post, telephone, e-mail or other means of services or products which may be of interest to you. Where we use your personal details to tell you about other products and services we will give you the opportunity to inform us that you do not wish your details to be used in this way.